From Blindness to a Bank P.O! Mr Ananda Rao hails from Ramagundam in Karimnagar District. One of the three children of an NTPC employee, he is a post graduate in Law. He suffers from a rare form of blindness known as RP (Retinitis Pigmentosa). Retinitis pigmentosa (RP) is the name given to a diverse group of inherited eye disorders. These eye conditions affect a part of the eye called the retina. RP causes permanent changes to the vision resulting in progressive vision loss. These changes may include difficulty with vision in dim light or the dark and the loss of side or peripheral vision. 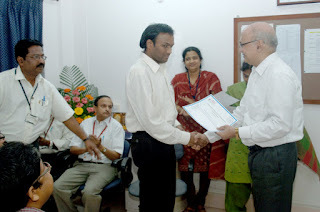 As part of his rehabilitation, Mr Ananda Rao trained on various assistive software at LVPEI, including JAWS (Job Access With Speech), besides courses in personality development, English language training, mobility training, as also computer skills such as MS Office and the internet. Referred by Mahindra Satyam, he is now recruited as a Probationary Officer with the Andhra Bank, and will commence with his training shortly. He recalls with joy the time he spent at LVPEI during his six months training program in assistive IT. He is grateful to his mentors Shiva, Sai, Hema and Beula, and has fond memories of the wonderful farewell party given to all the rehab clients on completion of their course. Koneti Ramanjanamma works as an Anganwadi worker for a government sponsored playgroup. She looks after the diet, health and play way needs of children under five years of age in her neighbourhood. But her own childhood was quite troubled. She had been dogged by a tough squint with her left eye turned inward to the extent that the black of her eye had gone under her nose and only the white eye ball was seen. Ramanjanamma recalls that not a single doctor had attempted to cure her, stating that vision would not be restored in her troubled eye. However, when she developed an unbearable pain in the left eye in February, 2013, she consulted an eye doctor in Kurnool who referred her to Hyderabad. Hearing about patients being treated without charge at L V Prasad Eye Institute, she made her way to the Banjara Hills campus of our Institute. Her squint was soon surgically corrected on 19 March 2013 by Dr Ramesh Kekunnaya who was ably assisted by Dr Shailja Tibrewal. Mrs. Veeramma from Tempalli village, near Gannavaram, visited our campus in Vijayawada on July 12, 2012, with her 2 children, who were blind since birth. She was told by someone that the institute provided certificates to blind children to help them avail Government facilities. However, on examination, her 6 year old daughter Roja was found to have total cataract in both eyes. Though she had noted white opacity in both eyes for her daughter at the age of 3 months itself, Veeramma had not opted for treatment owing to a bad prior experience involving her elder son who had the same problem since birth. He was operated in the right eye in a local hospital, but to no avail. Additionally, he developed constant pain and watering from the operated eye. This resulted in Veeramma losing faith in the health system, and not opting for any further treatment for her son or daughter. However, the counselors and optometrists at LVPEI tried their best to convince Veeramma to get Roja operated in both her eyes and her elder son for his left eye. Finally, Roja was operated upon by Dr. Niranjan Pehere in both the eyes, following promises of free treatment and medical care. Now after surgery, Roja wears glasses. There a significant improvement in her vision. She plays around, goes to school like other children and Veeramma feels very happy about it. Her vision is not as good as the other children, but whatever new vision she now has, has changed her life significantly. During the Support Group meeting for parents with children suffering from childhood cataract, where all parents came to share their experiences, Veeramma could not hold back her tears of gratitude. She is so enthused with her experience that she uses it to persuade families with blind children to seek treatment at LVPEI. Atoyebi Oluwabiyi Francis, 31, is from Basin Ilorin, Kwara, Nigeria. He is a graduate in geology, and a postgraduate in environmental management. Mr Atoyebi has been suffering from diabetes and hypertension. The vision in his left eye is very poor owing to diabetic retinopathy. He had consulted doctors in his home country; the doctors at the University of Ilorin Teaching Hospital (UITH) had advised him to go to LVPEI in India. This patient had bleeding inside the eye along with retinal detachment. At LVPEI, the silicone oil was removed three weeks post surgery. Silicone oils have been used as a vitreous fluid substitute to treat difficult cases of retinal detachment. After the operation, Mr Atoyebi, and his wife Mrs Omolola Justina Atoyebi, are jubilant that he is able to see clearly. He describes his experience at LVPEI as lovely and marvelous, and is especially grateful to his Dr Raja Narayanan. He says he is short of words, and does not know how to thank LVPEI enough.